Prosody is generally studied at a separate linguistic level from syntax and semantics. It analyses phonetic properties of utterances such as pitch and prominence, and orders them into phonological categories such as pitch accent, boundary tone, and metrical grid. The goal is to define distinctive formal differentiators of meanings in utterances. But what these meanings are is either excluded or a secondary concern. This book takes the opposite approach, asking what are the basic categories of meaning that speakers want to transmit to listeners? And what formal means do they use to achieve it? 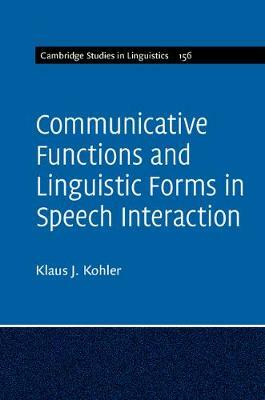 It places linguistic form in functions of speech communication, and takes into account all the formal exponents - sounds, words, syntax, prosodies - for specific functional coding. Basic communicative functions such as 'questioning' may be universally assumed, but their coding by linguistic bundles varies between languages. A comparison of function-form systems in English, German and Mandarin Chinese shows this formal diversity for universal functions.